Ventral view of a cleared and stained skeleton of Leiopelma hamiltoni. Note the inscriptional ribs which are visible as four blue, inverted V-shapes in the abdomen. There are only four living species of Leiopelma (family Leiopelmatidae), and these are the only native frogs in New Zealand. Human occupation has reduced the range of these species. Leiopelma archeyi is restricted to the Coromandel Range. Leiopelma hamiltoni is known from Stephens Island, and L. pakeka from Maud Island. Leiopelma hochstetteri remains from a few isolated localities on the North Island. However, three other recently extinct species are known from cave deposits in karst limestone regions of the North Island, and the genus was more widespread until Recent times. Adults of the living species reach a maximum size of about 50 mm. However, the subfossil Leiopelma †waitomoensis reached approximately 100 mm in snout-vent length. Leiopelma are terrestrial and are found under stones and logs in damp areas. They lay their eggs in these damp areas rather than in pools of water. Rather than having aquatic tadpoles, their embryos undergo a more "direct" development to froglets. 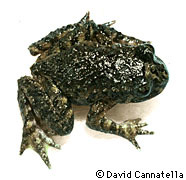 In Leiopelma hamiltoni and L. archeyi, the male sits over the eggs until they hatch; the froglets, still with a tail, climb up on the male's back and complete development there. In Leiopelma hochstetteri, the larvae move into nearby water after hatching, and there seems to be no direct parental care. Leiopelma is unique among living frogs in having elongate cartilages in the muscles of the abdomal wall, called inscriptional ribs (the four blue inverted-V cartilages in photo); the function of these is unknown. Like Ascaphus truei, Leiopelma retains certain primitive features such as nine vertebrae in front of the sacrum, and "tailwagging" muscles. These features do not indicate a close relationship, however. Molecular phylogenetic studies indicate that Ascaphus and Leiopelma are highly divergent. Ford and Cannatella (1993) defined Leiopelma to be the most recent common ancestor of the living species of Leiopelma (hochstetteri, hamiltoni, and archeyi), and all of its descendants. (L. pakeka had not been recognized as distinct at that time). By this definition, Leiopelma includes the three subfossil species included in Worthy's (1987) cladogram of Leiopelma. As is the case with Ascaphus, the only extant genus in the family Leiopelmatidae is the genus Leiopelma, so the name Leiopelmatidae is redundant. Synapomorphies of Leiopelma include the presence of ventral inscriptional ribs, low diploid chromosome numbers (18-22), absence of horny beaks in the larvae, and reduction of opercular folds during development resulting in the lack of a closed branchial chamber and spiracle (Green and Cannatella, 1993; Stephenson, 1955). Ascaphus and Leiopelma have usually been placed in the same family, sometimes called Ascaphidae or Leiopelmatidae (the latter name is the nomenclaturally correct one). This arrangement has been recognized as based on shared primitive characters (Green and Cannatella, 1993), because no morphological synapomorphies have been proposed to unite the two taxa. However, analyses of molecular data have indicated that Ascaphus and Leiopelma are sister-groups, but the divergence between them is very deep. Hay et al. (1995) analyzed relationships among families of frogs using 12S and 16S rRNA and found Ascaphus and Leiopelma to be sister-groups. The same arrangement was found by Roelants et al. (2005) and San Mauro et al. (2005). Current classifications include Leiopelma in the Leiopelmatidae, which like the Ascaphidae, retains two features that are primitive for living frogs: nine vertebrae in front of the sacrum, and "tailwagging" muscles. Because the only taxon in Leiopelmatidae is Leiopelma, the family name is taxonomically redundant, but many systematists use Leiopelmatidae to have a consistent listing of taxon names at the family rank. The distribution of the living members of Leiopelma is indicated in red. Click here for general list of references. Bell, B. D. 1978. Observations on the ecology and reproduction of the New Zealand leiopelmid frogs. Herpetologica 34:340-354. Stephenson, N. G. 1955. On the development of the frog, Leiopelma hochstetteri Fitzinger. Proc. Zool. Soc. London 124:785-795. Worthy, T. H. 1987. Osteology of Leiopelma (Amphibia: Leiopelmatidae) and descriptions of three new subfossil Leiopelma species. J. Roy. Soc. New Zealand 17(3):201-251. Page: Tree of Life Leiopelmatidae. Leiopelma. Authored by David Cannatella. The TEXT of this page is licensed under the Creative Commons Attribution License - Version 3.0. Note that images and other media featured on this page are each governed by their own license, and they may or may not be available for reuse. Click on an image or a media link to access the media data window, which provides the relevant licensing information. For the general terms and conditions of ToL material reuse and redistribution, please see the Tree of Life Copyright Policies.